Update Wednesday, Nov. 21, 8:30 a.m.
As expected, the rain and wind have cleared out the smoke in most of the Bay Area, bringing relief to millions of people forced to breathe air heavy with harmful particulate matter emanating from the Camp Fire in Butte County. But patches of red, categorized as "unhealthy," do remain on the Air Quality Index map. Now that the smoke has cleared, here's what you should do in terms of housecleaning to rid yourself of the remnants of this week-plus of pollution. And if, perhaps out of necessity, you've become an air quality nerd during this period, here's the Air Quality Index for dozens of California cities (the site has gone down intermittently due to high web traffic). The BAAQMD has current and recent AQI from individual monitoring stations. The private company PurpleAir maintains an interactive, crowdsourced AQI map with highly localized air quality numbers. Click here for a complete list of resources. Update Tuesday, Nov. 20, 8:30 a.m.
"Today will be the final day of hazy/smoky conditions." And that's not us blowing smoke; that's a direct quote from today's National Weather Service forecast. NWS says widespread rain will arrive late tonight and Wednesday, with scattered showers continuing through tomorrow. Then, a second system is expected to bring more rain Thanksgiving afternoon through Friday. We've seen some concern on social media that the coming rain may be "toxic" due to the smoke. The California Air Resources Board says that's unlikely. Meanwhile, right now, air quality is still unhealthy, so staying indoors is still recommended. In other bad-air news, some San Jose State University students are unhappy with the administration’s decision to reopen school Monday after shutting down last week due to the region’s poor air quality. Thousands of students signed an online petition demanding the school cancel classes this week after administrators announced plans to reopen. The students noted that the air quality index in San Jose remains in the red zone — which Santa Clara County Public Health Officer Dr. Sara Cody says is unhealthy for everyone. "When it’s at this level, the wildfire smoke can make anyone feel sick," Cody said. University Vice President Charlie Faas says the air quality has improved significantly since last week and with the end of term less than a month away, the school wants to make sure students about to graduate can do so. "We are monitoring this on an hour-by-hour basis," Faas said. The unhealthy air is also leading a group of advocates for the homeless to give away masks in Oakland. "Mask Oakland" co-founder Jay Redwoods says the group has given away 30,000 since the Camp Fire began. Today, he says the group has 60,000 additional masks ready for volunteers to distribute on the streets and through organizations. "Mostly, we have focused on delivering to the most marginalized," Redwoods said. "We work through community partners. We don't want to just have a run on masks by people who just have the best access to Twitter." Redwoods says Mask Oakland has raised about $80,000 through online crowdfunding in addition to company donations. He says the group plans to stockpile any leftover masks for future emergencies. Jon Brooks, Peter Jon Shuler and Ryan Levi contributed to this report. Update Monday, Nov. 19, 9:55 a.m. The National Weather Service says lingering smoke will continue today. A break in the weather pattern is forecast for late Tuesday and widespread rainfall is likely early Wednesday with showers possibly throughout the day. More rain may come Thanksgiving evening through Friday. 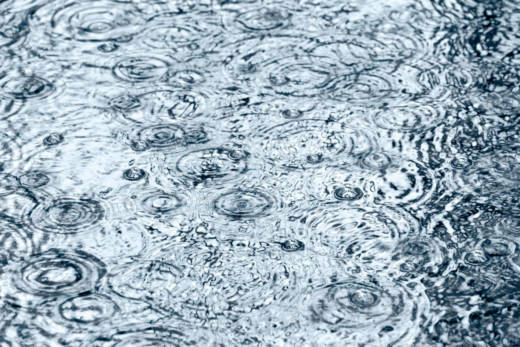 Rainfall totals are expected to be 0.25 to 0.75 inches in the general Bay Area and 1 inch to 1.5 inches at elevations greater than 1,000 feet in the North Bay, Santa Cruz Mountains and Big Sur areas. Right now, air quality for much of the Bay Area is still in the red zone, signifying "unhealthy" conditions. That means you should continue to limit outdoor exertion, and it's still best to stay indoors as much as possible. Here's the latest on school and college closures. Update Saturday, Nov. 17, 2:40 p.m. 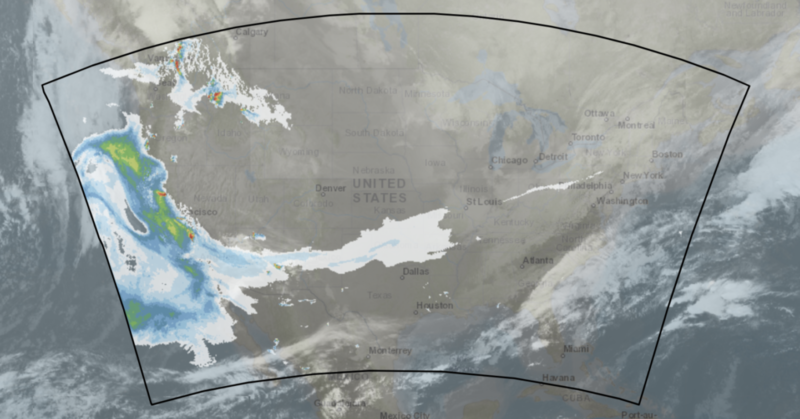 Weather and air quality conditions in the Bay Area have improved slightly on Saturday, but aren't expected to change much moving into Sunday, according to the National Weather Service. 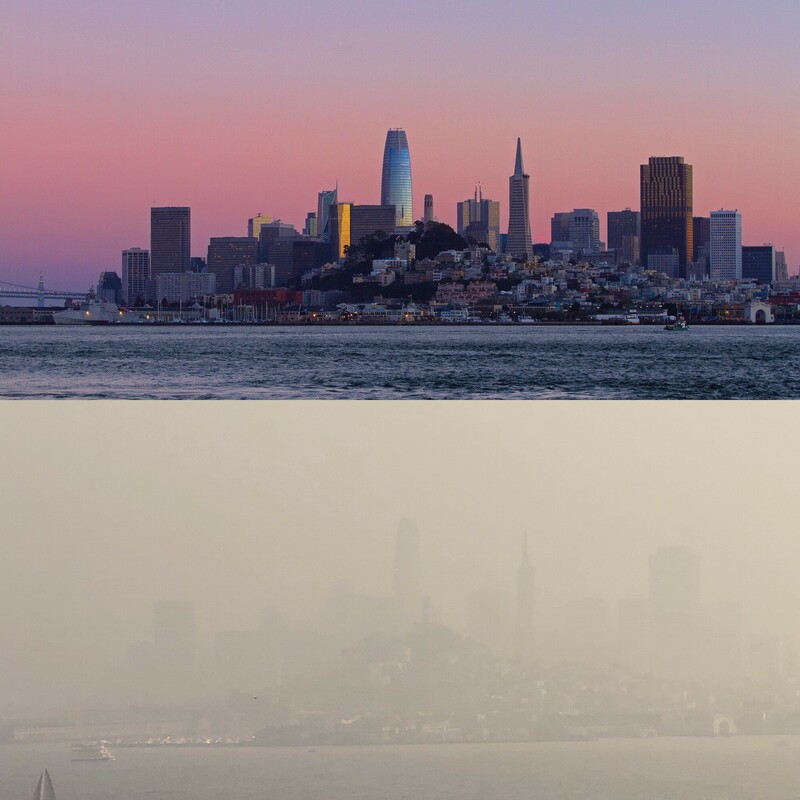 "Widespread smoke and haze at times combining with coastal fog resulting in extended poor air quality and low visibilities over the San Francisco Bay Area should show some improvement first along the immediate coast today then inland Sunday," the weather service said. Expectations of high winds in the Chico area have triggered a red flag warning in Butte County. The winds to the north could fuel the spread of the Camp Fire and continue bringing smoke into the Bay Area. With little to no wind coming in from the ocean, the smoke is expected to continue to blanket the region. The Air Quality Index for most of the Bay Area is in the red "unhealthy" zone, down slightly from the purple "very unhealthy" zone from Thursday and Friday. This week, San Francisco and Oakland recorded the poorest air quality since the Air District started measuring it 20 years ago. Local air officials on Friday extended the winter Spare the Air alert through Tuesday. Burning wood and other solid fuels is prohibited during this period, because it contributes to the poor air. The situation caused school systems and colleges around the Bay Area to shut down on Friday, and the annual Big Game between Stanford and California that had been scheduled for Saturday has been postponed two weeks due to the smoke. Forecasters continue to look ahead to rain that's expected to come starting on Wednesday and lasting through the weekend. See our air quality map, updated hourly, for air quality conditions in your area. The EPA has the current Air Quality Index for dozens of California cities. The BAAQMD has current and historical AQI from individual monitoring stations. The private company PurpleAir maintains an interactive, crowdsourced AQI map. More air quality resources here. Santa Clara County officials have opened a number of clean air centers for the public on the Peninsula and in the South Bay. Here is how to protect yourself from wildfire smoke. Visitor operations at Alcatraz Island, Fort Point National Historic Site and Muir Woods National Monument have been suspended through Sunday, the Golden Gate National Recreation Area announced Friday. But no matter how bad the air gets here, it's better than the situation in Chico. Smoke from the Camp Fire is still fouling the air in much of the Bay Area, and officials have extended the current Spare the Air alert through Friday. During this period, burning wood and manufactured logs is prohibited. Wearing masks outdoors are a second-best option, say air quality officials -- it's better to stay indoors. "Air quality continues to be unhealthy through much of the region and these conditions are expected to persist through Friday at least," the Bay Area Air Quality Management District announced Monday. "While weather conditions will vary somewhat throughout the week, air quality is expected to remain unhealthy because there is so much smoke trapped at the surface and surrounding the region." "This is the worst air quality we’ve had this year," the BAAQMD's Kristine Roselius, told listeners of KQED Forum on Friday. "It’s quite unhealthy." But you didn't have to be an air quality professional to render the same judgment. Smoke generated by the Butte County fire has blanketed much of the Bay Area for going on a week now, turning the sky a faintly pink or orange hue and the air quality maps an ominous red. The acrid air closed schools in Sonoma County and kept students in many districts indoors on Friday. Many people walked the streets outfitted with the N95 masks, certified to filter out toxic particles, that are becoming critical household items due to more frequent wildfires. Cole Hardware in North Beach has sold thousands of respirator masks, said store manager Tina Rotolo, cleaning out its suppliers. "We bought as many as they would sell us," Rotol said. "Eight hundred, 700, 500 at a time of any mask we could get our hands on." Giselle Smith, who works in KQED's garage, wore an N95 Friday as she checked in visitors to the station in San Francisco's Mission District. "I couldn't breathe," she said. "A lot of people who suffer from asthma had to call in and have asthma treatments." St. Anthony's soup kitchen and clinic in San Francisco has converted its dining room into an overnight emergency shelter for the homeless, something it usually doesn't do until winter. Opening early "is something we've never done before," said St. Anthony's spokeswoman Rachel Ball. In Oakland, volunteers are giving out respirator masks to the city's homeless. A group called Mask Oakland has given out 5,000 masks since Friday, says Cassandra Williams, a volunteer with the group. But the masks are a second-best option, said Roselius, from the air district. "Stay indoors, if at all possible," she advised. "That’s your first and best defense. The masks are not always effective." Roselius said masks need to be securely strapped, fit closely to your face, and pinched snugly around your nose to be effective. They're also not designed for men with beards or for young children, she said. Nor should they be reused, if it's avoidable. To protect yourself at home, keep your windows closed. The California Air Resources Board recommends HEPA air cleaners, which can greatly reduce indoor particle levels. If you’re in a car, close your windows and put your air conditioning on recirculate, which will help keep out the smoke. Tara Siler, Anna Kusmer, Marissa Shieh and Queena Kim contributed to this post.